Those were my thoughts when I first opened the package of Pedigree’s Breath Buster product. I really liked the scent. I felt really good about giving our beagles, Rocky and Daisey, such a healthy-smelling treat that also helped give them fresher breath. Now that your new doggy is home, I’m sure you’ve caught a little whiff of his or her breath. In most cases, doggy breath can use a little freshening up. We do brush our dog’s teeth. But not as often as we should. 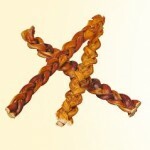 It’s easier to give a rawhide or a breath freshener dog biscuit. Which is why I was first interested in Pedigree’s Breath Buster brand. Then, one day, I saw Walmart’s store brand – the Ol’ Roy Fresh Breath biscuits – which cost less than the Pedigree brand. These too, were a good purchase. Plus, the biscuits smelled refreshingly minty too. My conclusion? I also like the Ol’ Roy brand. 1) Do you prefer big name brands? If yes, then the Pedigree brand is the way to go. 2) Do you base your purchases on price? I like saving money. Though, I also like finding a balance between quality and price. In this case, the Ol’ Roy brand is better on price. I’m in Canada and Ol’ Roy Fresh Breath biscuits cost $2.47. Whereas, the Pedigree brand costs $4.37 here. 3) Quantity: The Pedigree brand had more. It came with 32 biscuits. Ol’ Roy only had 29 biscuits. Still, for what I pay, Ol’ Roy still wins for me. 4) Size: Both biscuits are equal in size. However, this is the Medium/Large size of Pedigree’s Breath Buster. There is also a Breath Buster for smaller dogs. So far, I have only seen one size of the Ol’ Roy brand here in Canada. 5) Fun Factor: I really like the look of the Ol’ Roy brand. It reminds me of Lego. It also reminds me of a Domino game piece. 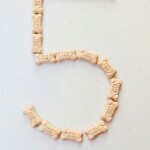 6) Calories: The Medium/Large Pedigree Breath Buster has 54 calories per biscuit. The Ol’ Roy Fresh Breath biscuit has 46 calories per biscuit. An awareness of calories is important because it helps your dog maintain a healthy weight. 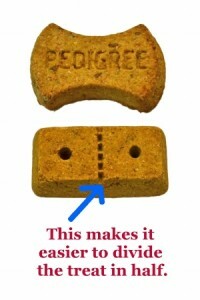 With the Ol’ Roy biscuit, if you look at the parting in the middle – this makes it easier to break the biscuit in half – if you want to save your dog some calories (each side will have about 23 calories). Or you can share the treat between two of your dogs. Vitamins added such as Vitamins A, E, and B12. Vitamins A and E are important antioxidants. They help maintain a healthy immune system. 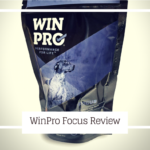 Vitamin B12 helps maintain a dog’s normal energy level. Both products are flavored with eucalyptus oil and parsley. These are the two ingredients that help fight bad breath. Breath Buster has extra vitamin supplementation – Vitamins B1, B2, and B6 – all important to a dog’s health. There are also no artificial colors or flavors added. 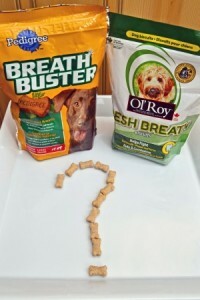 Ol’ Roy Fresh Breath biscuits has alfalfa added, though in writing this article, I learned that alfalfa is a debatable ingredient for pet products. It appears to be okay in proper, smaller quantities though. The Ol’ Roy brand also has rosemary extract added. Rosemary is a strong antioxidant and has anti-inflammatory properties. 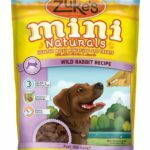 Now I personally feel good when I see vitamins added to pet products. But some vitamins for dogs appear to be debatable. So if you have any doubts, I would consult your vet or a pet health professional. 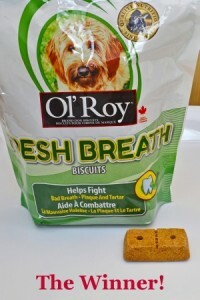 Ol’ Roy Fresh Breath biscuits! Where can I find Breath Busters? I have been looking for a couple of weeks now and where I usually find them, they do not have any on the shelf. That would be Big Lot Store in Grand Rapids, Michigan.